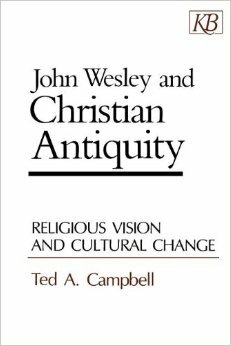 Ted A. Campbell, John Wesley and Christian Antiquity: Religious Vision and Culture Change. Nashville: Kingswood Books, 1991. This book is no longer available from Kingswood Books, but you can click here to see copies available at Amazon.com. John Wesley and Christian Antiquity offers a critical way of understanding Wesley and the larger phenomenon of the eighteenth century evangelical revival. Campbell argues that Christian Antiquity functioned for Wesley as an alternative cultural vision for religious renewal, much in the same way that classical antiquity served as a cultural model for secular Enlightenment thinkers. The book includes as an appendix an extensive listing of John Wesley’s references to ancient Christian writers.